It is our pleasure to invite you to participate in the 12th International Workshop on Positron and Positronium Chemistry. The conference will include invited talks along with contributed oral and poster presentations. 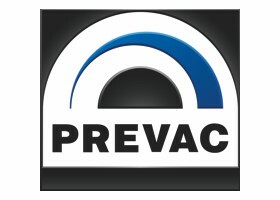 The detailed information about PPC12 can be found in our First Announcement as well as on this website. We invite you, your co-workers and students to registration, which is already open. 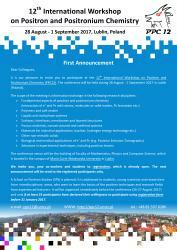 The next announcement will be send to the registered participants only. A School on Positron Studies (SPS) is planned. It is addressed to students, young scientists and researchers from interdisciplinary areas, who want to learn the basics of the positron techniques and research fields from experienced lecturers. It will be organized immediately before the conference (26-27 August 2017) and only if at least 25 participants have declared their willingness to participate using registration form before 31 January 2017. The School on Positron Studies (SPS) will not be organized due to insufficient number of students. The deadline for abstract submission for presentation and standard fee is extended to 9 June 2017 in response to numerous requests. An exhibition devoted to Maria Curie-Skłodowska at 150th anniversary of her birth (by Tomasz Goworek). Several interesting and little known episodes from her life of will be presented on posters. 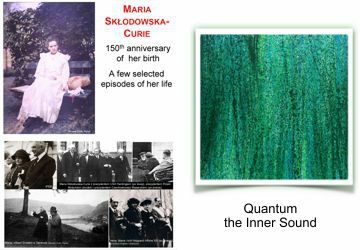 An exhibition of paintings by Kinga Kolouszek titled "Quantum - the Inner Sound". The painter creates her series of colourful abstract paintings inspired by quantum physics. You can find up-to-date information in the Second Announcement. The draft scientific programme with links to the abstracts is available and will be updated according to the latest information. Participants are asked to verify whether description of their presentation/poster is correct and complete. It is still possible to register for poster presentation or as an accompanying person. During the poster session will be held a contest for the most readable and visually appealing poster. The winner will receive a prize funded by prof. T Goworek during the banquet. The participants are asked to vote for two posters using a voting urn. around 15:30-15:45 on the Jerozolimskie street south of the Palace of Culture and Science (on the other side of the street than Polonia Palace Hotel) near two low buildings marked as "WARSZAWA SRODMIESCIE"
around 16:15-16:30 and at the Departures of Warsaw airport (Terminal A). You should look for a small bus marked PPC12 or a person holding a PPC12 banner. We would like to thank you all for your participation in PPC12! We had a great time and enjoyed very high quality and variety of your presentations and posters. We hope we have been able to create a stimulating environment for the exchange of experience and that it was inspiring meeting for everyone. 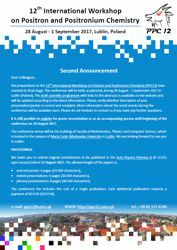 We invite you to share your presentations and/or posters by sending them to us (a PDF file is preferred). The presentations and posters will be available from the conference web page (next to the abstract on the programme subpage). Alternatively, you can give us a permission to use your presentation file that was copied to the presentation computer. The collection of the photographs taken during PPC12 is already available on the conference web page. The Workshop is an opportunity to bring together scientists and researchers interested in positron and positronium chemistry. This meeting allows to report on new results and achievements as well as on novel experimental and theoretical methods in this field.